Take a look at this gorgeous most-recent underbust Victorian corset by Jill, the youngest member of our corset-making team at ROMANTASY. You may click on the picture for a closer look. It’s truly lovely and functional, both! The patterned paisley silk added a modest upcharge ($40) to the basic price and the client can work on waist training with this corset, yet feel feminine at the same time! Plus the lovely fabric enables her to wear the corset out with a springtime dress or pair of slacks. We say that the more ways you wear your waist training corset, the better will be your investment. 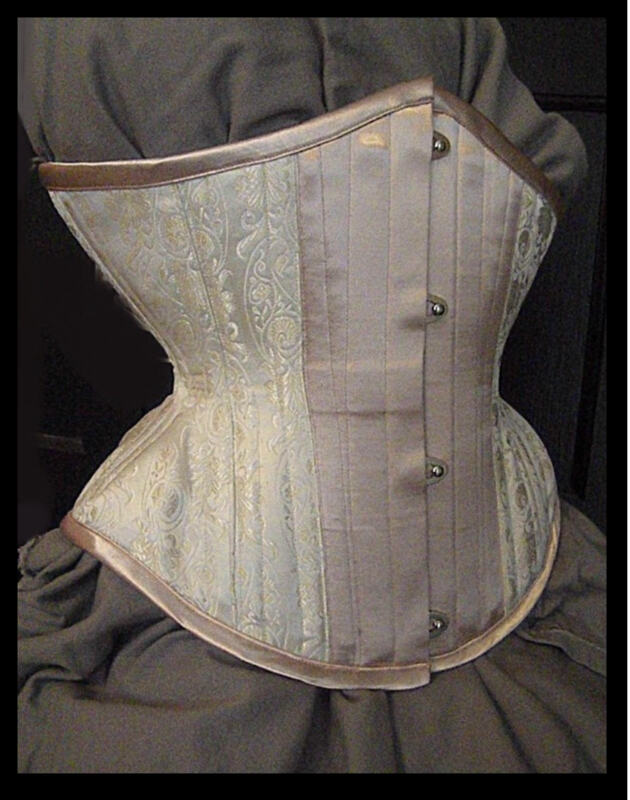 Choosing a color or fancier fabric can enlarge your uses for your corset. We’re happy to advise on measurements and other fabric choices! Today I had the most fascinating over-hour conversation with a professional, licensed nutritionist who has a current interest in corseting and improving her figure and posture. She’s as intense about her passion and knowledge-base in nutrition and well-being with a goal of enhancement of form and function in life, as I am regarding corsets and waist training. She pointed me to a food-based vitamin powder supplement she says that professional athletes are already hip to. Like me, you might want to check it out. It’s called Nutriversa. I’m not by any means recommending you try this; I’m not even sure it’s effective or price-available or even a responsible product, being about $65/mo. — ouch! for most of us. Check it out on choosereal.com. We must all do our ‘due diligence’ exploration of any new product we learn about, right? Right! I do know from a recent lecture I attended at UC Med Center by a clinician/instructor/research doctor who is an expert in vitamins, that other than about 800 mg of calcium and 800 IU of Vit D taken daily, all other vitamin supplements slightly tend to raise the risk of death in random controlled studies she summarize Read that sentence again. Yes, it’s true! This fact alone caused me to rethink taking my multivitamin. When I finish the present bottle I will cease and desist. Apparently the huge push to take supplements emanates from drug companies that stand to benefit. As my economist friend said, always ask and try to answer: “who stands to benefit?” when you are considering any idea or proposition. A student in attendance at the lecture mentioned above asked if any random controlled trials have been done using foods as sources for vitamins rather than chemical supplements? The doctor smiled wryly and admitted the negative, which we all knew anyway. I’m now seeking information about an apparently 18 year study done by the company producing Nutriversa, to see if it was a random controlled study, or merely an anecdotal study of lesser value in terms of results. I’d be interested to hear if anyone has heard of this product before, or uses it as a food-based supplement, and what were the results? Being food based my informant said it will take time to feel changes….but how long is reasonable “time,” and how do we know this works for the good and not for the financial benefit of the manufacturer? These are all open questions to be explored. Bret engages in periodic mini-training programs to enhance his shape and trim down some body fat. He often shares up-to-date information on nutrition, training techniques, and health advice with me, to pass on to students of waist training. Keeping good records on a daily basis during waist training is one way to focus one’s attention on what one actually eats and how one conducts one’s daily life. I believe there is a lot of mindless living going on and that we need all the help and advice we can get as to how to counter act that. Lately I’ve been reading a bit about Buddhism and militating against mindless living seems to be one of Budda’s principle concerns. Does that mean daily calorie-counting during training? I’m not so sure. I don’t recommend it to my coaching students, tho it might be important the first two weeks when a person new to waist training might be breaking three meals a day down into the recommended eight snacks per day. It’s fairly easy when one starts this process, to overeat. So counting calories with some precision might be wise. I’ve blogged before how careless choices of standard sizes of bowls or plates can lead one to think we are eating a normal recommended portion, when we are eating far more than that! Perhaps I don’t recommend counting calories because I’ve observed that’s a very difficult thing to do in terms of settling upon what is “recommended” to drop or to maintain one’s weight. As a coach, I’m more interested in two things for my students: (1) seeing a downward trend in inches and pounds over the weeks of training but generally ignoring daily results, and (2) seeing more change in waistline inches than pounds, since pounds can vary from 2 to 8 from one day to the next! Further, over the past year I’ve been thinking about my mom’s increasing age and declining health in terms of what she now eats and weighs at age 96. As viewed in the picture from some 20 years ago, she has a very slim build and now a more shrunken height due to osteoporosis (she was 5’5″ and now is 5′). Her present reduced weight of 85 lbs. is not desperately serious, albeit concerning. But she never weighed more than 108 pounds and for the past 10 years, has never weighed more than 100. Thus, I doubt that what would be considered “normal” for her in terms of calorie intake today would be much more than 800-900 calories per day. At my height and weight of 5’6″ and 116-120 lbs., I doubt I could be expected to eat more than about 1200-1500 calories per day to maintain my figure. To lose weight, I’ve always had to drop back to about 1000 – 1100 calories per day. Yet my sister claims I should be eating 1500 calories a day and mom should be eating 1200. I rather doubt that. Would love to hear from others trying formal waist training as to how they relate to calorie-counting and intake in terms of effectiveness, and what importance they find in journaling about diet, calories, and exercise. New diet pill; nature, or a little assist? Must blog quickly this am lest I forget what I must research soon. Yesterday on GMA a new pill was announced to control obesity, a risky condition which is apparently prevalent in 1/3 of Americans today. Experimental subjects lost 10% of their body weight, but I’m not sure the time period required for that result. Side effects include memory loss, birth defects, increased heart rates and more. Of course, the percentage of these risks as a possibility is important to know in order to make an informed decision to take the pill (or any medication) or not. Today GMA covered the increased use of provigil by military pilots, pro atheletes, and top tier executives who want significant increase in their cognitive abilities. One executive said he would rather have his life shortened (if that is the future fact revealed to be true), because he “liked to really live.” But is he “really living” at a hyped-up, pharmacologically-induced state? Aren’t folks on “speed” and other amphetamines really “living” — or are they just addicted to the rush and fail like those hooked on provigil, to appreciate the limitations and possibilities of just living a human life? The downside of provigil is a life threatening rash which is rare — but then this off-label use of provigil has little track record so far, and we just don’t know what might develop over years of use. I’m certain we will hear more about provigil and other pills many Americans like to pop to fix problems they perceive, or achieve results they desire. After all pills minimize the effort it takes to become fully conscious in the moment and strive to maximize the enjoyment of every second of one’s life, and make more natural decisions regarding nurturing the humanity we have been given to enjoy. Lately I’ve been concentrating on another unique element of waist training, and that is the pre-training period of time. This may be the time during which you are awaiting delivery of your corset. Normally corset production takes from one to three or even more months. Most folks become quite enthusiastic to begin training during this time, and the motivation can be put to productive use before the actual corset arrives. The first thing we recommend is that you purchase a training belt. 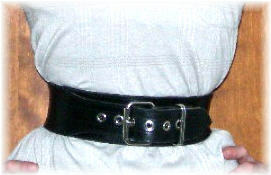 The belt can vary in terms of fabric from which it is constructed but should be from 2 to 4″ wide. We recommend you push in at your waist with your thumb under your lowest rib and first finger on your pelvic bone, determine that width and order accordingly. From time to time ROMANTASY offers a belt of heavy lattigo leather, however, we are not in production presently. 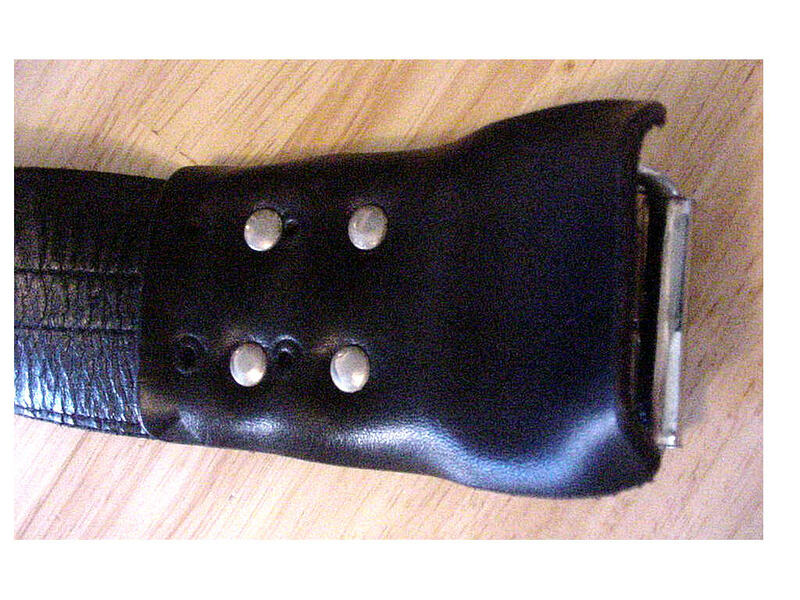 Normally any leather belt should have a flap under the buckle to protect the skin. You may see such a belt being worn at the left above, and the suggested flap on the image immediately to the left.. Note that you should never wear a belt directly on the skin in order to avoid excessive perspiring and/or skin pinching.Wear your belt over a very tight tshirt or cami or chemise not made out of cotton, but out of microfiber or other synthetic material. Cotton retains moisture and the less moisture under your belt, the less chance of skin itching and eventual breakdown. Valeo responded to a recent email that “99% of our products are sold on Amazon.com. Also, if you go to http://www.valeoinc.com and do a retail search after clicking on the “Fitness Tab” you can do a local retail search by zip code. If you provide me with a zip code, I would be happy to do it.” John Collins. You may reach Mr. Colins at:john.collins@ebbrands.com or 1-888-838-9144. This nylon belt will also take on the contours of your torso much like a lattigo leather belt, and can sustain many pounds of waistline pressure as does a leather belt. Because it adjusts to your body, it therefore becomes more comfortable the more you wear it. Finally, we often recommend that a client search their own closet or go to a used clothing store to purchase a wide leather belt. Often sturdy belts at very low cost can be found there. Even a sturdy wide plastic belt might work. It can be worn over a dress or top and appear quite fashionable. To prepare for that tight belt, I start with my high school red leather lighter weight belt and cinch tightly. Then I change to the first grommet of my Training Belt and go from there . However, it might be worth it to take some time and invest in a higher quality belt that will last. For example, my lattigo leather Training Belt is my ‘go to’ item when I have not corseted for some time and want to recover my slim waistline and ability to tight lace. It’s now 10 years old and has seen quite a bit of use. It’s also rather handsome with a royal blue leather leaf design so it can be worn over a dress or top for a fashionable look. As said, any belt should be from 2 to 3″ wide or in the case of the fabric belt, perhaps 4″ wide. Too stiff or wide of a belt will permit the upper edges to dig into your lower ribs and upper pelvic bone during the seasoning process and can hurt. Care must be taken to go slowly in cinching the belt down, just like during the corset seasoning process. What Bret, one of our remarkable waist training coaching students recommends, is that the Valeo belt be cinched down to a snug level and worn several hours a day for a week, then gradually tightened and build up hours of wear. Before your corset arrives, try sleeping with the belt on. Choose a weekend day when you will not need to go to work the next day, in case you cannot sleep well when you first try. It took me five nights of trying to sleep with a corset loosely laced before I succeeded. At first I would wake up about 4 am and have to bound out of bed and take the belt off! Eventually it became second nature to sleep tightly corseted. In the next blog I’ll share more ideas from Bret and I about what to do to prepare for corset waist training. Please send us your ideas, as well! I’m often asked if waist training with corsets really works. It’s true for my client s and coaching students, but I’m always pleased to hear from others who also reach their goals. Recently I sold a 15″ corset to a lady who started about a year ago to waist train. Her original waist size was 28″ and she was 5’2″ and weighed 125 lbs. 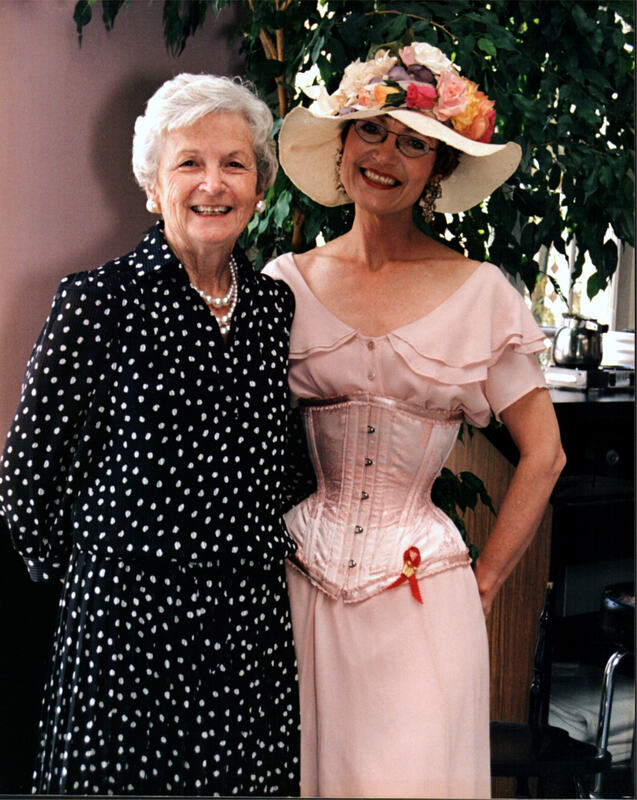 Today her waist varies from 18 to 19″ and she can corset down 2″ rather readily and for 20 hours per day. That kind of daily corseting and discipline is not for everyone to be sure. But for those who like to challenge themselves, the process can work remarkably well. Congrats to both ladies for their remarkable success. It’s not always an easy process because some days your body will rebel. We have a chapter in our book “Corset Magic” that deals with strategies to overcome the rebellion.